SAN FRANCISCO – On this day, March 8, 2000, we do not know where Master Wan Ko Yee (H.H. Dorje Chang Buddha III) is. Although he is not in California, his outstanding accomplishments, remarkable contributions and high moral character have added luster to the State of California. 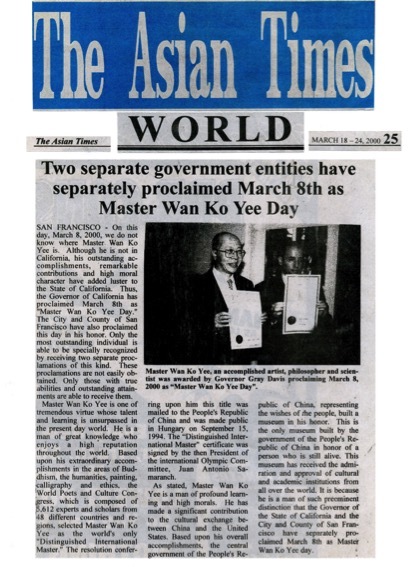 Thus, the Governor of California has proclaimed March 8th as “Master Wan Ko Yee (H.H. Dorje Chang Buddha III) Day.” The City and County of San Francisco have also proclaimed this day in his honor. Only the most outstanding individual is able to be specially recognized by receiving two separate proclamations of this kind. These proclamations are not easily obtained. Only those with true abilities and outstanding attainments are able to receive them. Master Wan Ko Yee (H.H. Dorje Chang Buddha III) is one of tremendous virtue whose talent and learning is unsurpassed in the present day world. He is a man of great knowledge who enjoys a high reputation throughout the world. Based upon his extraordinary accomplishments in the areas of Buddhism, the humanities, painting, calligraphy and ethics, the World Poets and Culture Congress, which is composed of 5,612 experts and scholars from 48 different countries and regions, selected Master Wan Ko Yee (H.H. Dorje Chang Buddha III) as the world’s only “Distinguished International Master.” The resolution conferring upon him this title was mailed to the People’s Republic of China and was made public in Hungary on September 15, 1994. The “Distinguished International Master” certificate was signed by the then President of the international Olympic Committee, Juan Antonio Samaranch. Master Wan Ko Yee (H.H. Dorje Chang Buddha III) , an accomplished artist, philosopher and scientist was awarded by Governor Gray Davis proclaiming March 8, 2000 as “Master Wan Ko Yee (H.H. Dorje Chang Buddha III) Day”.